Oliver (Stephen Amell) and Laurel (Katie Cassidy) team up on the Monday, March 25 episode of ARROW…but things don’t go as planned. 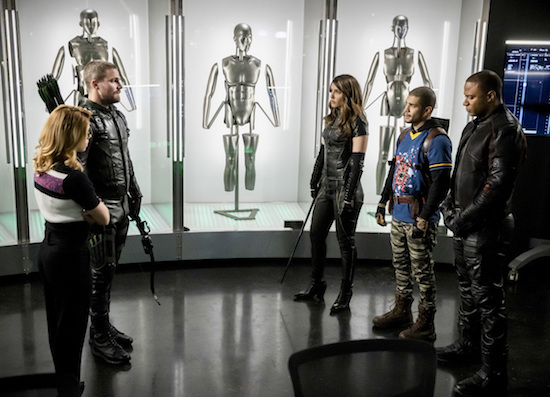 Arrow -- "Inheritance" -- Image Number: AR717b_0441b -- Pictured (L-R): Emily Bett Rickards as Felicity Smoak, Stephen Amell as Oliver Queen/Green Arrow, Juliana Harkavy as Dinah Drake/Black Canary, Rick Gonzalez as Rene Ramirez/Wild Dog and David Ramsey as John Diggle/Spartan -- Photo: Jack Rowand/The CW -- ÃÂ© 2019 The CW Network, LLC. All Rights Reserved.